Brainwavz have asked me again to review their new range of earphones. This time I am reviewing the Jive series of earphones. The Jive set is a model of wired earphones that are available in 5 different colours: Black, Blue, Green, Red and White. I have been sent the green set to review. The earphones come with an in-built volume control on the wire complete with a microphone and call/play button so you can make hands-free calls without the need to invest in the more expensive Bluetooth alternative. I tried out using the microphone on Skype and the quality was abysmal. This may be due Skype but have never had the problem before. The earphones cost $28 so what do you get for you money? 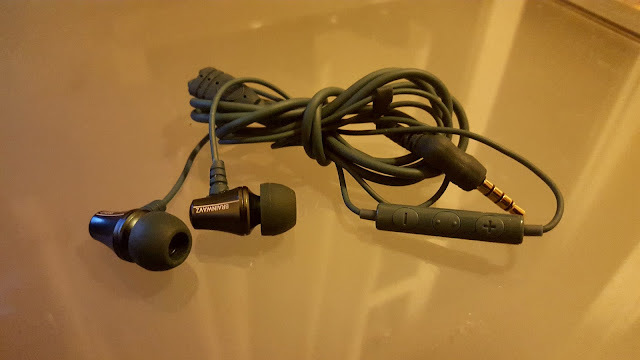 Well of course you get the earphones their self but you also receive the standard Brainwavz hard case to protect them. In addition you receive a Velcro cable tie, 3 silicone tips (S,M,L) and a set of comfy Comply foam tips. This is all the standard stuff from the company. But this is the first time I have noticed a shirt clip included in the pack which will help with concealing the wire and protecting it from being tangled and damaged when performing physical activities like running. Now let's get down to the important stuff. The sound quality. This is a slighty improved quality of sound from the BLU-200 I reviewed last week but that may be down to the wired connection as opposed to the wireless. I used these whilst walking around for about an hour capturing Pokemon (I know, my life's great). They served me well and don't show any signs of damage what so ever but do seem slightly less durable that the previous models by looking at their build but only time will tell. Again, since you receive multiple different sizes and shapes of ear tips the comfort isn't really an as you can change how you please. I used the already attached ones (medium) as they fit and feel best. This model has been kept light-weight and minimalist so it doesn't pull or drag your ears to the point of discomfort. The earphones come with a huge 24 month warranty so Brainwavz must be confident in the durability and strength of their product. If you would like to purchase a set of Jive by Brainwavz for yourself then please click here.